Laced through with flamboyant fun and frolics, floaty frocks and big, feathery hats, this show comes, too, with secret doors, secret romance, spies, deceit, intrigue, stolen diamonds and swords at dawn. 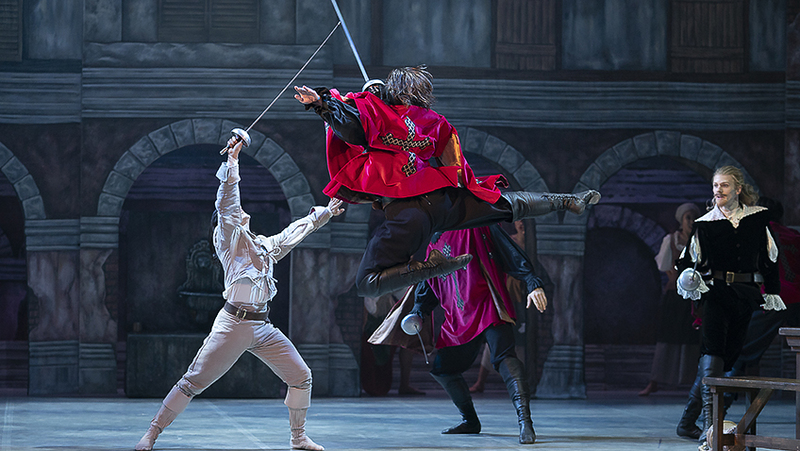 Set in Louis XIII’s seventeenth century France, the ballet was first staged in 2006, based on Alexandre Dumas’ 1844 tale of The Three Musketeers in which ambitious, eager, young country boy D’Artagnan leaves Gascony for Paris and a life of action-packed escapades and love. The suspense of the storyline and well defined lead characters keep the drama moving while fine ballet abounds with leaps and lifts a-plenty – at balls, fights, duels, amongst bevies of whimsical washerwomen and in many a romantic pas de deux. 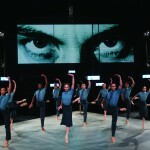 David Nixon’s choreography is set to a varied, lively score of music played live and vibrant by the Northern Ballet Sinfonia under John Pryce Jones and composed by Sir Malcolm Arnold. Though Sir Malcolm wrote but a few sketches with The Musketeers actually in mind when working with David Drew whose original scenario this was, the rest of the score has been compiled by Anthony Meredith, drawing far and wide from his other works. Contrasts in tone and texture from brassy brass, haughty horns, fluty piccolos, plucky violins, comical clarinet, resounding timpani and all the rest range from stately to folksy, from romantic and lyrical to riotous and rousing, from military march to comical whimsy, with clear breaks and changes often separating scenes. Largely, the seventeenth century romance and adventure fit pretty well with the music – apart from odd occasions when a 1950’s/60’s film-land or an episode of What the Papers Say spring to mind. The show also serves, then, as a great celebration of Arnold’s music. Large-scale sets take us from panelled Parisian palace to washing-hung courtyard, to inn, dark street or cell, while a clever silhouette horse-chase and a ship departing Calais provide uplifting visual highlights. Visual splendour comes, too, with the costumes, the silent, lurking villains Richelieu and the Comte de Rochefort dressed respectively in plain red and black, in contrast to the flamboyant colours and sparkle elsewhere. Diaphanous or cut-away gowns for ladies and flexi-boots for men mainly allow legwork and line to be further admired, while some wonderfully designed “butterfly” cloaks impress with spread and flutter as an integral part of one dance. Sean Bates is a big hit as a striking King Louis XIII with his kingly – and queenly! 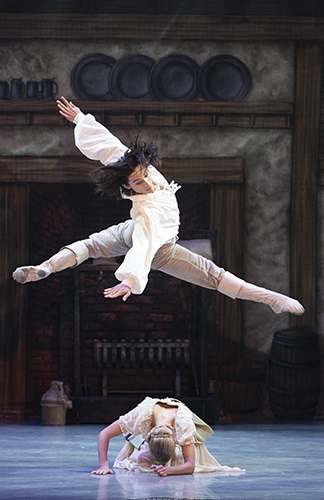 – dancing, while Kevin Poeung creates a much loved D’Artagnan, dancing in supple whirlwinds through neatly choreographed duels, then more tenderly with his beloved Constance (Antoinette Brooks-Daw). 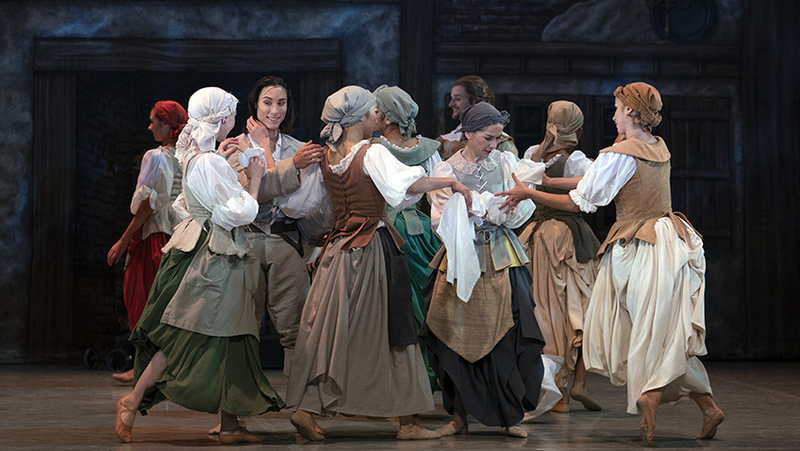 The sensitive pas de deux between the Queen (Nina Queiroz da Silva) and her lover, the Duke of Buckingham (Joseph Taylor) also bring special moments. In spite of all the villainy and a cold, quietly ruthless Milady de Winter (Hannah Bateman), nothing remains dark for long; the Queen’s diamonds (and honour) are saved and, for the most part, it’s all for one and jolly japes for all. The Three Musketeers travels next to Canterbury.